Oh boy do I love these bars. But, let’s be honest, I love anything with caramel and chocolate. These are probably one of my favorite bar cookies that I make. I’m not sure what it is about them, but these cookies rock, or as my boys would say “they’re sick” (in case you’re wondering, that is their way of saying they are REALLY GOOD!). The best part about them is they have oatmeal in them so they have to be some what healthy . . .at least that’s what I keep telling myself every time I dive in for another one. Unwrap caramels and place in medium size saucepan, add half-n-half and cook on low heat, stir until melted and smooth. Set aside. Mix melted butter, oatmeal, flour, brown sugar, baking soda and salt in a mixing bowl. Stir until well combined. Set aside 1 1/2 cups of this mixture and press remaining mixture into a greased 9x13 pan. Bake at 350 for 10 minutes. 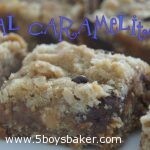 Remove from oven and immediately pour caramel mixture evenly over base. Sprinkle with chocolate chips and butterscotch chips. Sprinkle reserved oatmeal mixture evenly over chips. Bake for an additional 15-18 minutes or until golden brown. Allow to cool completely before cutting. These are FANTASTIC!!! Thanks so much for all your delicious recipes! Love your blog!!! Oh I love these carmelitas too! Thank you Suzanne for the nice comment, I really appreciate it! Somedays I wonder if anyone ever even looks at this little old blog of mine, so thank you for taking the time to comment.